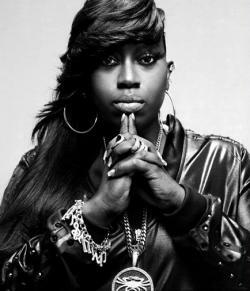 Melissa Arnette "Missy" Elliott (born July 1, 1971) is an American singer, songwriter, rapper, and record producer. Her first major success came as a songwriter with childhood friend and producer Timbaland on projects for Aaliyah, 702, Total, and SWV. As a record producer and songwriter, she has worked with Whitney Houston, Mariah Carey, and Janet Jackson, as well as contemporary artists Keyshia Cole, G Dragon, Tamia, Monicaand Ciara. In the late 1990s, Elliott expanded her career as a solo artist and rapper, eventually winning five Grammy Awards and selling over 30 million records in the United States. Elliott is the only female rapper to have six albums certified platinum by the RIAA, including one double platinum for her 2002 album Under Construction. Elliott is also known for a series of hits and diverse music videos, including "The Rain (Supa Dupa Fly)", "Hot Boyz", "Get Ur Freak On", "Work It", and the Grammy award-winning video for "Lose Control."